Felicity Harley-McGowan | Amazing Lookalike! On the left is the Australian Dr. Felicity Harley-McGowan, specialist in early Christian and medieval art at Yale Divinity School. 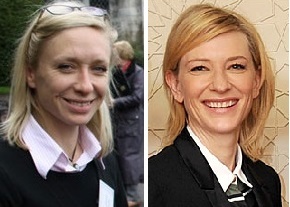 On the right is Australian actress Cate Blanchett, who played Elizabeth in Elizabeth and Jasmine in Blue Jasmine.